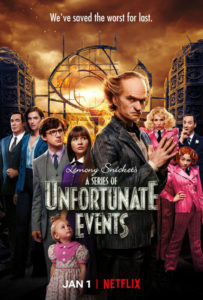 Another dreadful trailer has been released for the final season of A Series of Unfortunate Events as we move ever closer to the conclusion of the Baudelaires’ misfortunes. Klaus and Violet themselves give a recap of the ordeals they have suffered in the last two seasons while Count Olaf vehemently denies any wrongdoing. As previously reported, this third season will feature adaptations of the last four books in the series, The Slippery Slope, The Grim Grotto, The Penultimate Peril, and The End. This season will only have seven episodes as opposed to the previous seasons where two episodes were devoted to each book. The trailer shows some exciting scenes from the upcoming season including a submarine, an island, a snowy slope, and the entrance to the Hotel Denouement, a very significant setting in the series. Familiar faces also appear including Jerome Squalor, Esme Squalor, Carmelita Spats, and all of Olaf’s henchmen. We also hear more from the mysterious lady who appeared at the end of the second season and who seems to be an ally to the three Baudelaire orphans. She asks them to volunteer and they eagerly agree. There are also some sinister characters expressing their disappointment of Olaf’s schemes. There’s also a brief scene of Lemony Snicket stepping out of a taxi and introducing himself to the three orphans. Whether this will actually take place is still debatable as nothing is ever as it seems in this series. “We’ve saved the worst for last,” says the latest poster, and it’s clear that the three Baudelaires have quite a rough journey ahead of them.